The Dark Knight trilogy of Batman films are beyond popular, they have a massive fan base and have broken some big blockbuster records. As everyone knows, the Dark Knight films are based on a series of Batman comics (if you didn’t know that then a big “WTF?” to you), but what few people know is that in the Legends of the Dark Knight comics there was a mini story-arc involving a werewolf. That’s right comic book fans, Batman and werewolves! 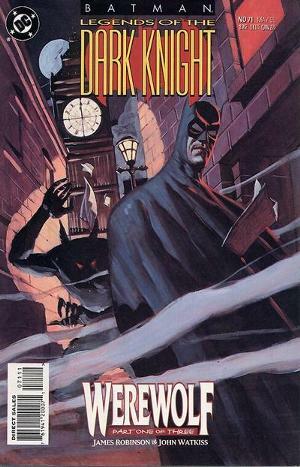 Written by James Robinson and illustrated by John Watkiss, the werewolf arc in Legends of the Dark Knight can be found in issues #71-73. Simply titled “Werewolf” the story follows our hero as he battles it out with a ferocious and murderous werewolf. The werewolf arc was published earlier this year, so printed copies of issues #71-73 shouldn’t be too difficult to come by. But if you’re big into instant gratification like me, you can download the digital copy from DC right HERE for $1.99 per issue. I haven’t read these comics yet (not a Batman fan GASP!) but I am pretty geeked that Batman battles it out with a badass werewolf. Anything with werewolves is rad. Have any of you read this arc? If so, what did you think? And for those that haven’t read it, will you now?